Access your email from any location and any device with an internet connection. Empower your remote workers to accomplish more while staying on top of every communication. Your information is stored in the cloud, so lost data from crashes, server or hardware failure are a thing of the past. Secure backups allow full restoration in case of any type of disaster, ensuring your uptime no matter what. Establish as many unique email accounts as you need at no extra cost. Subscription-based pricing structure provides a predictable monthly spend and can be scaled instantly when the need arises. Shared contacts, shared calendars and integrations with popular CRMs like Salesforce make it easier than ever to make it easier than every to stay connected in today's competitive business landscape. Your communications are also all backed up and will be available instantly from an alternative location or connection if your office network ever suffers an extended period of downtime. 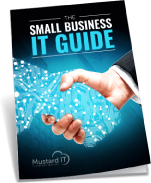 Mustard cloud email solutions make it simple for you to communicate in the office and on the move. No need to worry about server hardware or software. We’ll manage everything, enabling you to connect via PC, tablet or smartphone.